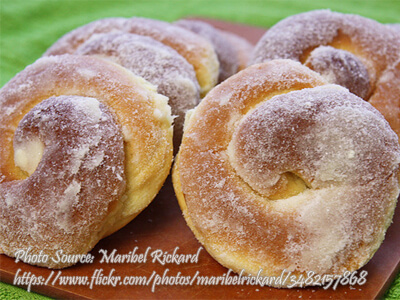 Ensaymada or ensaimada is a favorite and popular Filipino fluffy bread coated with margarine and butter. Usually the shape is round and resembles a bloated pancake. But some are shaped like large muffins. They are many varieties of ensaymada nowadays especially the commercial ones sold in big bakeshops. Some are loaded with grated cheese and coated with butter, some has filling inside and some have different flavors like ube. But the original ensaymada with it’s plain sugar and margarine coating will always be the favorite. Add 1 cup flour gradually until well blended. Cover bowl with a damp cloth and set aside in warm place for 30 minutes. Meanwhile, cream butter and sugar thoroughly; add salt and egg yolks, beating well after each addition. Add 4 cups all-purpose flour gradually, blending well. Add this mixture to the sponge yeast. Mix well. Put dough in slightly greased bowl and cover with a damp cloth and let rise in a warm place for 2 hours. Punch down. Divide dough into desired size of rolls. Roll out thinly. Spread surface with melted butter and sprinkle with grated cheese. Place in greased ensaimada molds. Let rise for 2 hours. Bake in preheated oven at 400 °F for from 10 to 15 minutes. After taking out from oven, brush with butter and sprinkle with grated cheese and sugar. Hi Amm, I’ve corrected the recipe already. Hope this helps.